The Hike the Cape walk is the first three days of the Great Ocean Walk. You'll walk 50.5km of the ‘Mild Side’ of the track and we'll transport all your heavy gear for you. Accommodation: 2 nights. Queen or twin share available with private bathroom. One room per 2 people. * If 22km is too far for you, we can drop you at Shelly Beach to start the walk (making it 14km). Walk91 will provide a short, personalised briefing the day before you start your walk. We’ll give you a map, tide chart, walk notes and emergency position-indicating radio beacon (EPIRB). Plus, we’ll answer any questions you have and explain your itinerary and other important information. Remember that we are never far away and you can call us any time! This morning you’ll collect your freshly packed lunch as you head out of Apollo Bay. The start of the walk commences with a stretch along the coastline offering sweeping views of the Cape Otway region. The track then meanders into the rainforest of the Great Otway National Park. Hike past tree ferns and tall eucalypts found in the wet gullies, through tall forests and along old forestry tracks. Spot black wallabies who inhabit this area, before winding down the trail onto beautiful Blanket Bay. This accommodation is located in the Otway National Park. It is set within a magnificent forest of tall manna gums, housing koalas and a multitude of birds. The cabin is very comfortable with a lounge/dining room area, full en-suite and kitchenette. Internet and laundry facilities are available for a small fee. There is a shop on the premises selling basic food items. Self-catered: We transfer your food with your luggage to your accommodation. Catered: Dinner, continental breakfast and pack lunch for day 2 is included. This Conservation Centre is a magnificent post and beam, mud brick structure, set within kangaroo meadows. Integrating beautifully with nature and adjoining the Great Otway National Park, the multi award-winning centre offers superb dining and exquisite surroundings in the beautiful setting of the Otways. The centre is certified as an advanced eco-tourism destination and also has a library and nature studies room. The comfortable accommodation which is solar powered has en-suite bedrooms. Feel free to ask the knowledgeable staff about the flora and fauna and the rehabilitation of local and injured wildlife. If desired, they will take you on a tour of the grounds in the golden light of the evening. The centre’s founders, Lizzie and Shayne, are qualified scientists dedicated to the conservation of biodiversity and ecological systems, recognised by the Banksia Foundation, the UN and the Australian Prime Minister. Meals: Dinner, continental breakfast and pack lunch for day 2 are included. As you set off today you will enjoy wonderful views over Parker Inlet. The vegetation changes to dry coastal forests inhabited by echidnas and king parrots. Following the track to Victoria’s oldest lighthouse, enjoy the breathtaking views of the Bass Strait from the cliff tops. Remember to look up into the manna gums, as they are home to the local koalas. Today you visit the Cape Otway Lighthouse where you can walk up the 18 metre, 150 year old lightstation and learn a little of the lives of the hard-working, isolated and incredibly resourceful lighthouse keepers. Visit the telegraph station built in 1859 and the World War ll radar station. Accommodation and included meals are the same as night one. Setting off today you will pass the old lightstation cemetery. The tombstones reflect the hardships experienced by the early settlers here. The track then meanders on towards the wild and wonderful Station Beach, which is littered with driftwood. Take a small detour to Rainbow Falls, or carry on walking to enjoy sweeping views from the cliff tops. You’ll walk along the Aire Heritage River and over its bridge, towards Castle Cove. This magnificent beach has its own lookout station; a great way to end your days walk! We will transfer you back to Apollo Bay at approximately 4pm. We can lend you walking poles if you would like them. We can lend you a mobile phone if you are visiting from overseas. Transfers to and from your start and finish points are included where required. 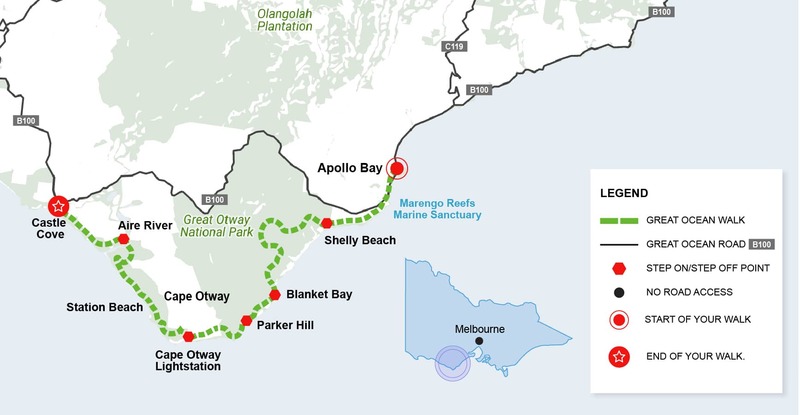 Detailed transportation options to and from Apollo Bay are available on the FAQ page. We are happy to cater for any special dietary needs (please let us know when you book). It’s important to prepare for your walk. See the FAQ page for some tips! Absolutely fabulous organisation, from enquiry through to booking and all the way through to final day of walk. The itinerary was very well planned - daily start and finish times were realistic, allowing plenty of "rest" time. The first day briefing was excellent. Everything went to plan and the accommodation was perfect. What a treat to arrive at these lovely places after a hard days walking.